Severity and Priority are related to the defect like when a tester finds a bug, the bug may be the huge bug of small bug. As a tester we should be able to find out whether bug has major impact or small impact on the system so that as per the impact of the bug, developer can consider which bug solve first , many tester are get confused while selecting the Severity and Priority. The Severity is selected by the Tester and Priority is selected by the project manager or developer and sometime tester also involved in it this activity. Let’s understand the meaning of the Severity and Priority one by one and how to find out the severity and priority of the bugs/defects. Severity means the impact of particular bug on the software. Impact may be small one or major one. How that particular bug, impacts on the functionality of the Software is tells us the Severity of the bug. For example. Let’s say you are testing a social networking site and first is login when you tries to login in by entering the password and username then software crashes this mean the impact of bug is major on the system so severity will be high and say you have found a spelling mistake then severity of that bug will be low. A bug can be marked as a critical when software is not installing or software data is getting corrupted. Such a huge issue which has a very critical issue in software. A bug can be marked as Major when there are issues like majors part showing issues because of that we are unable to proceed testing further. Issues like login is not working, after doing anything we are redirected to a blank page. Means an issue which has a major impact on the software and normal working flow is getting interrupted be that bug. We can mark a bug as a Medium or Moderate when a functionality of the software is working but generating a wrong result, working but working as unexpected. The output is not matching with the expected input but system is generating some result.such a type of bug can have Medium / Moderate Severity. A bug which does not cause any termination of the system, which does not cause any undesired or wrong result generation is called a low or minor bug. Means bug is there but the impact of the bug on the system is not high. Example of such a bug is a small spelling mistake in content or any small UI mistake is there such a bug can be marked as low / minor severity bug. Basically this is a part of enhancement where tester suggest the enhancement needed in the software that too only related to UI , Graphical and Text field changes. As the Severity is related to impact but priority is all about time. A time to fix a bug whether the bug is need to fix now or in future. In simple word priority means deciding when to fix the bug. 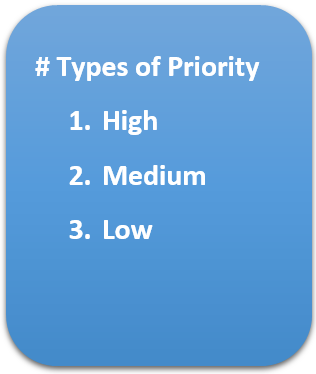 Priority decision depends on many factors like impact of the bug, release build requirements. Means the bug which has a high priority need to be fixed as soon as possible. A bug without which we cannot proceed our testing further such a type of bug can have high priority, and bug is a part of current software release and software release or build release date is far closer then it need to be fixed as soon as possible. 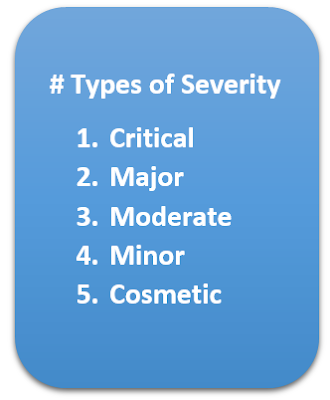 Usually a bug with high severity is marked as high priority, for example. A login system of ecommerce site is not working then that bug is marked as high severity and high priority bug. But it’s not necessary that a bug which has a high severity always have high priority, such an example can be like there is a spelling mistake in the company’s logo. Impact of this bug is not high because it do not affect the features or work flow but so it may give as a low severity bug but it affect the company’s image which can cause loss of revenue or companies reputation so the priority is high for such a bug. In simple word, High priority bugs need to be fixed as soon as possible. A bug can be marked as a medium priority bug when which does not affect other part of software and does not result into the termination of the software. And to solve this bug we can wait till next build or we can wait till next release. Like it’s not urgent to solve this bug. So the bug is marked as medium priority bug. A bug which has very negligible impact on software, if it’s a not a part of current release it’s a part of future release and does not affect any feature of the software, like a bug which related to UI , small spelling mistakes , grammatical mistakes.